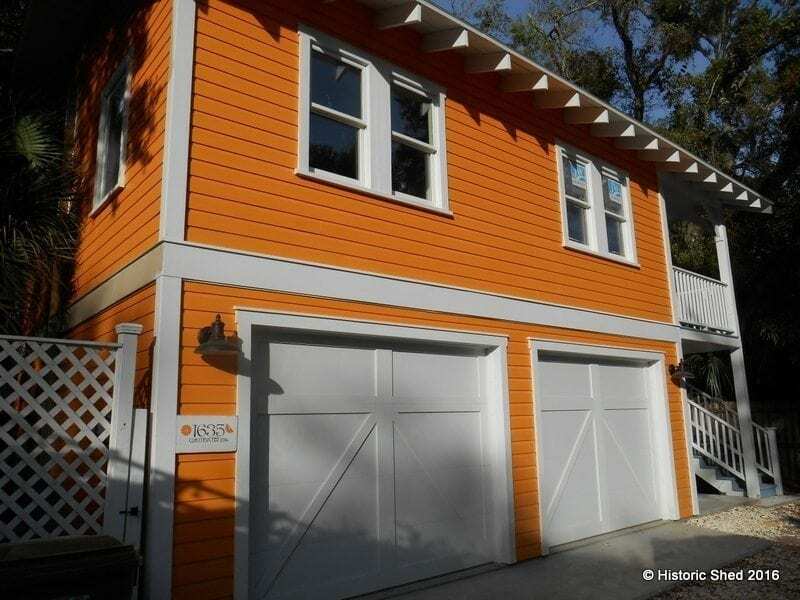 Several years ago I was contacted by a woman who was in the process of buying a house in the historic Gillespie Park neighborhood in Sarasota. 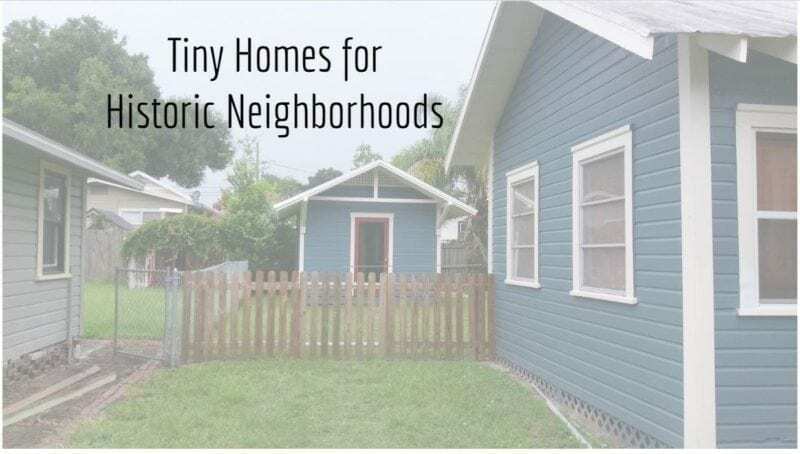 The 1920s house came with a detached garage in not-so-great shape, placed awkwardly in the middle of the yard and she wanted to replace it. Then she had a few big life changes, including moving out of the country, and the plans for the garage were put on hold. When she called back last year, she no longer wanted to just replace the garage. Instead, since the main house was being used as a vacation rental, they wanted to add a garage apartment that could also be rented out. Historic Shed™ designed a two-story, two car garage apartment with details that complemented the main house with a one bedroom, one bath layout. We also included a large porch for a private sitting area for visitors, accessed by an exterior stair. The cottage is available for rent at: https://www.vrbo.com/811457 So far, it has some rave reviews. 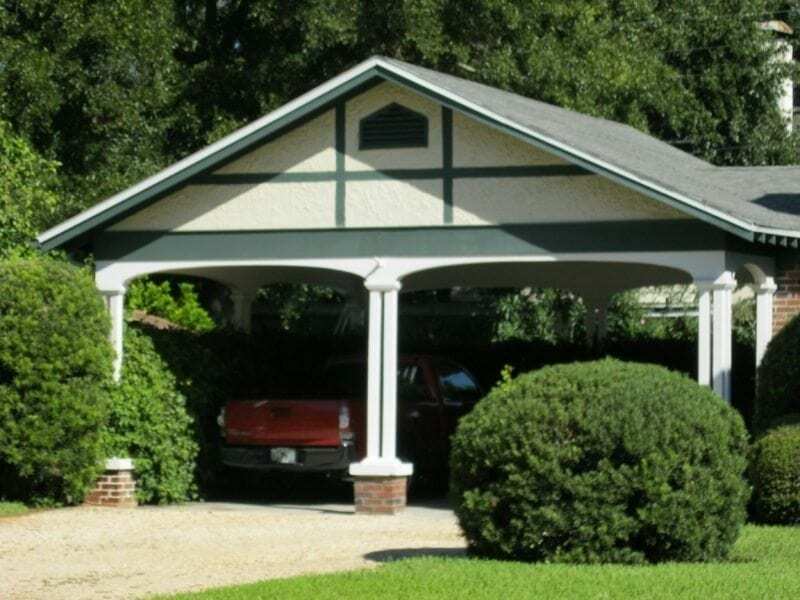 We were approached by someone in the historic Duckpond neighborhood in Gainesville looking to add an accessory cottage in her back yard. 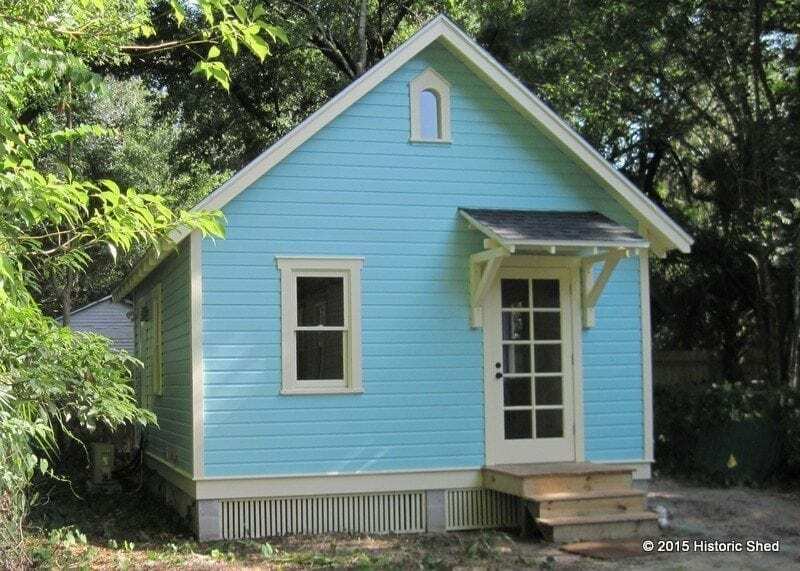 After some design iterations, we ended up building a 16'x20' version of our Starlet cottage with elements that complemented her historic home. The design was approved by the Gainesville Preservation Board. This week's Let's Blog Off title is If you can’t afford the tip, you can’t afford the meal and the topic is Price vs. Value, or "what are we willing to pay for products and services, and what do we expect to get in return?" Like all small businesses, it's something we think about often here at Historic Shed. Clearly we are not your typical shed maker, but how specialized can we afford to be without pricing ourselves out of our market or not being able to afford to cover our expenses? It's a balance we are always trying to maintain, and one that will get more difficult as we continue to grow. Some thoughts on value added, or what extras you get from Historic Shed: We are sticklers for authentic historic detail. Even if you are not an old building specialist, you can tell when windows have been replaced or an addition has been built onto a historic house incorrectly. Our outbuildings make architectural historians do a double take (and no, it's not faking history or going against the Secretary of the Interior's Standard for Historic Preservation, but that's for another post) and we take great pride in this. Our buildings look right at home in any historic district. We offer design services for all our products at no charge, even for customization. Construction drawings even for small outbuildings can cost from $500 to $3000, and are needed whenever a permit is required. Sometimes we forget to emphasize this service. And the quality and experience of our designer. We choose to build with quality materials that will last. We could built a shed with lesser quality wood for framing and roof sheathing, which reduce our costs (and be much lighter for delivery) but we wouldn't feel good about the longevity of our product. 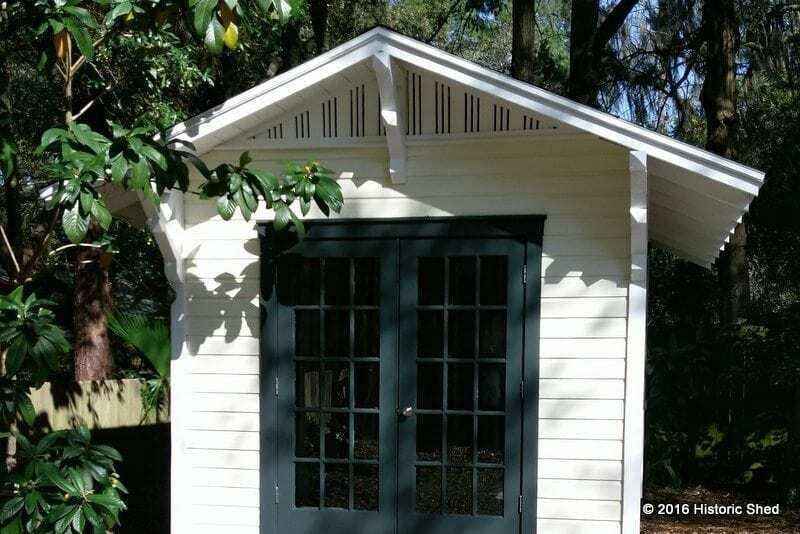 We received a call not too long ago from a woman who bought a manufactured shed from another company. The doors were rotting in less than 2 years and she hoped to install a pair of our doors as a replacement. I told her we'd gladly sell her new doors, but we'd have to look at her existing shed to see if it was built sturdy enough for our much heavier-duty shed doors. Less than 2 years of service from her shed seems like a poor return on her investment. A few months ago we added an "economy" shed to our product line. 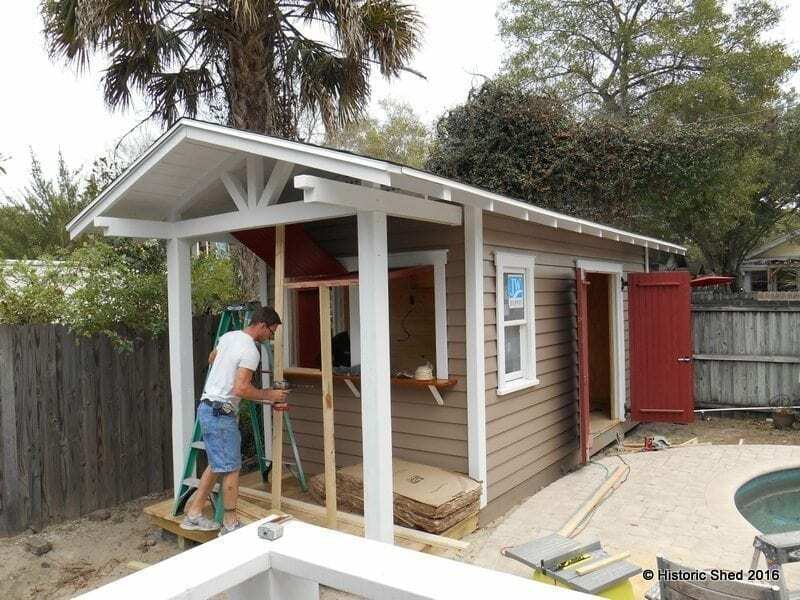 The shed looks like a historically accurate board and batten shed, and is as durable as our regular sheds, but we use exterior grade plywood sheathing instead of true boards for the exterior. We have slightly lower material costs, but much quicker assembly so we can offer it for substantially less than our regular shed line. The trade-off is that the shed may not have the same exterior materials as the main house on the lot. We choose to build our sheds in a warehouse instead of on site. This gives us much better quality control during construction, allows us to service a larger area from our central location, and reduces set-up time on site. This gives us an advantage over site built contractors who would show up at your house every day for weeks, or even months to build structures like ours. We typically take 2-3 days to set up a shed, 1-2 weeks for a garage , and 2-3 weeks for a finished cottage. We are very amenable to customization. We know every old house is unique and our sheds, cottages and garages reflect this. 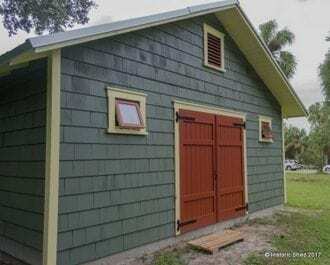 We paint our outbuildings to your color choice at our shop. Not only does this give you a completed shed, ready to use as soon as we finish set-up, but it helps the longevity of our product by applying a proper protective coating on your building under a controlled setting. Our business model from day one has been to create attractive, historically appropriate outbuildings that will last as long as the historic buildings they complement. We hope to be in business for many years with many happy customers who feel like they got a good return on their investment.